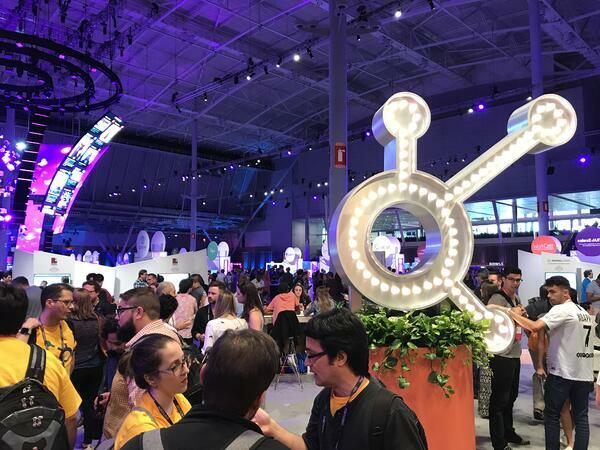 The new product announcements kept on coming at INBOUND 2018. Video marketing has received a much-needed boost with the new HubSpot Video feature, a standalone CMS has also been launched while the Enterprise Growth Suite has been unveiled as HubSpot’s newest tier. HubSpot also unveiled some other new features for marketers and businesses to use and enjoy - the Marketing Hub Enterprise. This blog is part of a series of blog posts which explores all of the different product launches announced by HubSpot at INBOUND. The blog below looks at all of the features included in the Marketing Hub Enterprise that have been announced. For stuff on the Enterprise Growth Suite, head here. HubSpot has crafted the features to help accelerate growth, that’s the basic gist of it. The more sophisticated marketing teams are craving for new ways to drive growth so that goals can be both reached and surpassed. The Marketing Hub Enterprise features give marketers and businesses plenty of powerful tools to take advantage of so that you’re able to get more out of your content and grow better as a result. This is in comparison to the other offerings like the Sales Enterprise or the Service Hub Enterprise from HubSpot, or even other marketing automation software like Marketo or Infusionsoft. Let’s take a look at all eight of the features announced. What is it? - Content Partitioning is new in Marketing Enterprise, and it uses the Teams feature (also a new release) to segment assets in HubSpot. This gives the right users easy and uncluttered access to the content they need to see and have access to. How does it help? - This feature is useful for businesses that might have international marketing teams or even teams that are segmented across divisions. So, if you’re tired of having your marketers all crammed into one portal which creates an even bigger headache, this eliminates the issue. With Content Partitioning, you’re able to segment landing pages, website pages, blog, CTAs and pretty much anything else. This makes it much easier to control who sees and edits the content in a single portal. What is it? - The Additional Domains feature allows you to host and track multiple sites, microsites, blogs and landing pages across different top-level domains. By purchasing the feature, businesses can manage separate brand and domains from a single instance on HubSpot. How does it help? - Basically, you no longer need to purchase two separate portals which collapse all brands or domains into one HubSpot portal. Additional Domains lets you segment out new domains traffic analytics and you can limit domain publishing to specific teams within one enterprise portal. Not only does this make life so much easier, but you can manage content, segment contacts and create reports based on each part of your business to see how you're doing as a whole. What is it? - The new Analytics Filtering feature allows you to create analytics segments by the country of the session, the domain and even specific URL structure. How does it help? - This feature is highly beneficial for businesses that use HubSpot to track multiple domains, subdomains, subdirectories or partitions of content and contacts. Plus, if you’re a business or marketer that wants to be able to see traffic data and other analytics segment and aggregate, then this is a welcomed release. What is it? - The Email Frequency Safeguards feature allows you to set safeguards so that you avoid over-emailing your contacts in a given time period. Despite that, it’s easy to allow high priority messages to override the safeguards that are put in place. How does it help? - It’s simple - nobody likes to be bombarded by emails from the same company over and over again. With this feature, you get the all-important assurance that you or your marketers won’t be overloading a contact’s inbox and drive them away. There are already plenty of opportunities to email a contact, but that also means that there could be too many opportunities when thinking about things like workflows, blog emails and more. It’s no fun seeing a contact receive three emails in a day and then 15 throughout the rest of the week. This feature allows you to choose how many emails in a given time period can be sent. What is it? - Businesses will now have enhanced social permissions to hand to relevant markets. This gives certain members of your team the ability to draft posts and move them to a scheduled state for review before they can be published. How does it help? - With this feature, you’re able to allow certain users, such as junior and new employees or even those with a genuine interest in exploring the social side of marketing, a chance to learn. You’re able to draft social posts without permitting them to publish them as it’s a good way to learn without risk. Plus, it gets more people participating. What is it? - The new social feature means marketers can now run a full inbound funnel using Facebook Messenger. This eliminates the need for forms, landing pages or emails. How does it help? - Now, you’re able to create conversational experiences in Facebook Messenger to create contacts by filling out information and launching Messenger experiences from onsite CTAs. Businesses can even reach their right or new target audience by providing a direct content offer or collecting prospect information and benefiting from the pre-populated Facebook user data. What is it? - Another new feature in the Marketing Hub Enterprise, CMS membership restricts content access to internal audiences, paying customer or other groups of people using HubSpot lists. How does it help? - CMS membership allows you to restrict viewing access to any published pages to specific contacts in your database. For example, you can use this new feature to deliver premium content like videos, toolkits or case studies to paying customers or registered contacts. What is it? - It’s no secret that video marketing is a critical element in any marketing strategy. So, the new YouTube integration is evidently a highly-anticipated feature that will bring many benefits. Through this, marketers can view detailed statistics on the performance of any video content that has been uploaded to your YouTube channels. How does it help? - Along with viewing those essential performance statistics, you can track the performance of those videos from right within HubSpot. This means you don’t need to continue clicking back and forth to get those stats. You can also report on how many views your videos are getting, how your subscriber base is growing, the view time on your videos and so much more. What is it? - This feature automatically and continuously tests assets, such as lead flows, with a single click. It means that there’s no need to manually create multiple A/B versions and worry about statistical significance. How does it help? - Right now, if you want to run A/B testing then you need to expand on the upfront cost. There’s also the effort to decide what to test, creating variations manually and then understanding how long you need to wait until there’s a statistically significant result. HubSpot has revealed that by using a testing technique called Multi-Arm Bandit (MAB), you’re able to remove all of those complicated decisions. Instead, you’re able to continuously test your own assets instead. Note: All of the features highlighted above are available to you if you purchase the Marketing Hub Enterprise. If you purchase the Enterprise products separately (Sales Enterprise, Service Hub Enterprise and the standalone CMS), these features won’t be available. If you invest in the Enterprise Growth Suite, the Marketing Hub Enterprise and the other Enterprise products come as part of that purchase - so every feature is available. Along with the new Marketing Hub Enterprise product launches, HubSpot also announced the latest product releases for the new Enterprise tier, the brand-new video features as well as the standalone CMS. Check them all out by heading to our blog page.